and keynote speaker Alexandra Morton. 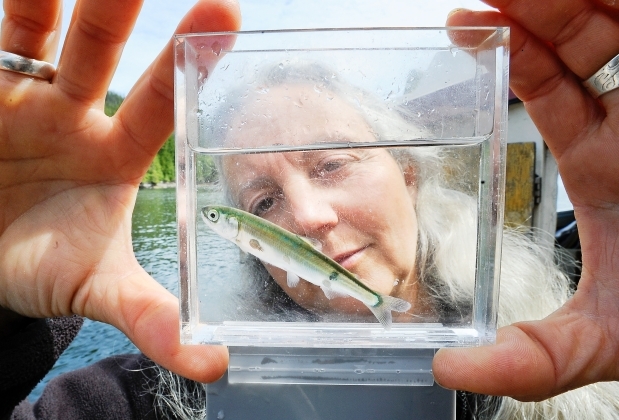 Over the past two decades, independent marine biologist Alexandra Morton has dedicated her career to researching the impacts of Atlantic salmon net pens on wild Pacific salmon and steelhead in British Columbia. Alex is recognized across the globe for her precedent-setting research and has published 25 papers investigating the relationship between open-water Atlantic salmon aquaculture and wild fish health. Alex's research was fundamental to guiding Washington state's recent legislation that will phase out all Atlantic salmon net pens in Puget Sound by 2022 and continues to guide Wild Fish Conservancy's work to address the threat of Piscine Reovirus (PRV) in Puget Sound's remaining net pens.